If you observe the video below, you may see that density on the simulated scalp reduces as it is stretched. 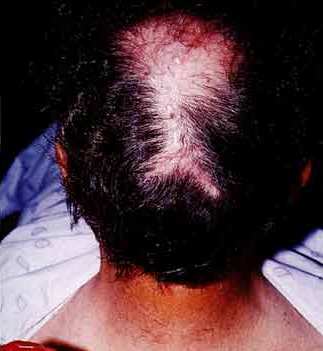 The more the scalp is stretched, the more the density is reduced. This rule can be applied to strip hair transplant (FUT) harvesting method because density is calculated based on quantity of follicular units over total area under consideration. 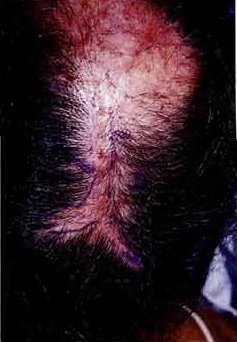 After a reduction, the crown tends to move outwards and away from the central area of the scalp. The reduction may be applied to the crown itself. Both extremities of the incision tend to move outwards or away from the central area. Some ‘stretchback’ may help increase density on the scalp to a small degree. Tissue elasticity varies from patient to patient but reducing the scalp area inevitably reduces density. The total number of follicular units never increases after any reduction or harvesting and overall appearance of the scalp will be altered. For physicians, the only benefit of reducing the scalp is that the length of the surgical procedure is considerably reduced. For the patient, the benefit is the reduction in expense for the procedure. The actual gain by the scalp reduction is usually partially or always lost after ‘stretchback’ occurs. This means the gain was time and money. The loss was the appearance which is gone forever. Density = Follicular units/Area, therefore density decreases. Ive seen pics over the years of stretched donor scars on these websites. That is what some of the strip proponents seem to convieniently forget. Even if you pre-stretch the scalp, that skin is going to want to pull back over the YEARS post-surgery, and its going to pull in all directions around it. When the scar stretches, there is that thickening white line of scar tissue, just STUCK there…inhibiting a man from buzzing the back short. Furthermore, there is another reason to not want to remove strips of donor flesh from the back of the scalp at this time. Follica, and more remotely, ACELL. If Follica’s method of wounding the skin and generating new hair follicles by inhibiting epidermal growth factor post-re-epilithialization works…a man would be throwing away the skin with the cell lines that produce the best donor-area hair. Skin that he could use to perhaps grow MORE DONOR HAIR in the future if either of these two methodologies work out. If a man gets a FUE (or CIT or whatever you want to call it), the skin is STILL THERE. The patent (Follica’s anyway) calls for new hairgrowth even in a scar also…so the potential for “making” new donor hair would exist even in the small holes where the FUE was extracted. But if one cuts out a big swath of the donor area…that skin is gone for good. No hair can be “made” from it. Even if one FUE’s IN hair to a strip scar…the skin color and stretching are still going to be an issue if he cuts his hair short, and the slight changes in direction of surrounding hair might also present a problem. Small-instrument FUE’s done by professional hands are easily the least invasive, least scarring kind of hair surgery available now. Ive seen some stretched donor zip scars that pulled out fairly wide when the patient swore that it “used to be pretty small” in the past. Its a concern for anyone getting a strip. » Ive seen pics over the years of stretched donor scars on these websites. » That is what some of the strip proponents seem to convieniently forget. » from buzzing the back short. » away the skin with the cell lines that produce the best donor-area hair. wow. I’m so speechless. Thanks you guys. » can be “made” from it. » least invasive, least scarring kind of hair surgery available now. » concern for anyone getting a strip. You’re welcome. I will try my best to bring other grey areas to light. It takes time for individuals to learn. » » Ive seen pics over the years of stretched donor scars on these websites. » » That is what some of the strip proponents seem to convieniently forget. » » from buzzing the back short. I have a scar from a futbol accident from 4 years ago. I now have hairs coming through it. Could u shed some light on this one? » » can be “made” from it. » » least invasive, least scarring kind of hair surgery available now. » » concern for anyone getting a strip. » » » from buzzing the back short. » » » strips of donor flesh from the back of the scalp at this time. » coming through it. Could u shed some light on this one? » » » can be “made” from it. » » » least invasive, least scarring kind of hair surgery available now. » » » concern for anyone getting a strip. Attached are acutal pre and follow-op photos of a scalp reduction procedure. Consistent with simulated scalp reduction, you may see the effect of how the procedure produces very little or no benefits for the patients. The crown also tends to move downward after the scalp heals. Believe it or not, there are still physicians who perform scalp reductions and lifts. I hope this may be useful information for all individuals researching hair loss solutions. Who would want these old HTs? Better yet, any HT surgery that involves a scalpel isn’t one I’m looking to have. Lots of strip guys say they didn’t know about the scar. I would feel self and at least graft it. Thanks for putting up that video and explaining strip drawback, it makes things very clear to newbies. Strip definately changes the atonomy of the scalp by destroying a load of healthy tissue. » things very clear to newbies. I don’t know how I missed this video, I agree with you Bart, the video says it all. » » things very clear to newbies. Recently, we have had the pleasure of telling many teenagers that they don’t need to consider having an HT until they try medical therapy. Sadly enough, a couple impatient young adults went to a big well-known clinic and had strips performed. These patients were 17 and 19 years of age. The hair transplant industry can offer both good and bad for patients. It is also sad that the uneducated patients suffer most! » also sad that the uneducated patients suffer most! btw CIT, good job with the video, it doesn’t get any clearer than that. » btw CIT, good job with the video, it doesn’t get any clearer than that. Honestly, you would never think that this scenario actually happens in real life. The patients had the procedures done in the USA! The fact that so many younger patients don’t do their homework.